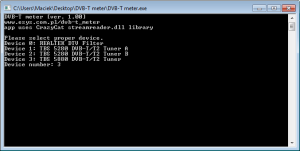 DVB-T meter is app, which should make terrestial antenna installation easier. It has two parts – „server” part and client part. „Server” part is an app designed for MS Windows, the client part is designed to use with Android operating system. This app was originally written to support TBS5880 (and other similar usb card which support StreamReaderEx-BDA library) but it should also work with other DVB-T BDA devices. Off course the number of shown parameters will be lower, but it still should work fine. 2. Download and unpack “server” part – you can download it here. If you got missing library error – you can download missing stuff from here. 6. If everything is fine – app should run OK.
First you need to download the software from here (version 1.0), and unpack the archive. Then you should check if you got connected proper BDA device. Next step is to launch the DVB-T meter app and select your device from the list. Then in most cases pop up window will show. You should agree to add new rule to your windows firewall. Then you should check your local IP address (famous ipconfig command). If you don’t know how to check it – please see this video http://www.youtube.com/watch?v=s2WJ6FwbASk . And that is pretty everything. If you have Geniatech T230 device – you can try version 1.01 – it should work OK with my app. Of course, the IP address must be entered correctly for your computer. After the approval of the application settings it will begin to send requests for information to the computer with the specified IP number. In the upper-right corner of the screen there are two gray symbols circles. 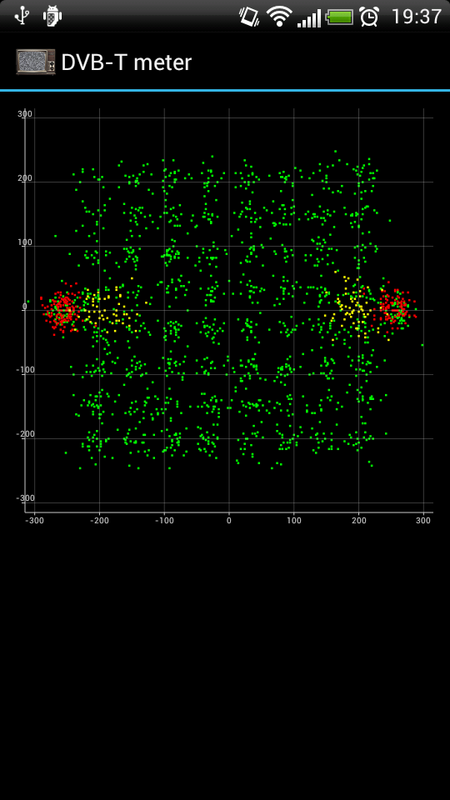 One of them should blink green (which signals the sending data), the other should blink Red (which signals the receiving data). If the data is sent and received is probably application works correctly. If only flashes green icon-there is something wrong with the server part of the application, or you typed the wrong IP address. Now if you select from a list interested channel, after a while in the upper part of the screen should display a frequency. This is very important, since it is obtained from your computer data. So if the item selected in the list and the other from the information are not equal – please try to retune it. In the current version there is a small “bug” – to retune channel first you should tune to the other channel. In later versions, I will try to fix it. If the level and quality of the signal bars are above 30%, there will be produced sound with pitch proportional to the signal level indication. If you have a TBS5880 card or another compatible amount of available information about the signal is much larger and they are. information about the signal modulation, correct indicator “signal lock” signal level, SNR, preBER, BER and constellations. 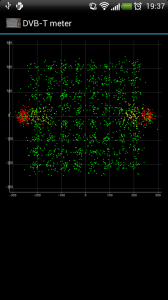 In the case of the constellation are colored red and yellow TPS and pilots (with the DVB-T standard – with other standards it can be different). Sometimes after a long time of the data collection from the constellation, computer app can crash. All comments and suggestions I would contact my email address.